​Kerry has been involved with horses all her life and taught riding and horsemanship skills to children, youth and adults over many years. Kerry trained and worked as a Speech Therapist on the NSW North Coast from 1967 – 1974. In 1975 Kerry developed a program with horses for students from Biala Special School Ballina. In 1979 she founded the Ballina and District Riding for the Disabled NSW Centre which operated on her property until December 2013. Having witnessed the benefits horses give to people with physical and intellectual disabilities Kerry believed that the work with horses could be extended to people with behavioural and emotional challenges. In 2000, having been awarded a Churchill Fellowship, Kerry travelled to the USA to study programs and participate in workshops being conducted in various part of that country. This was an amazing learning opportunity. On her return Kerry focused more on providing programs with the horses at RDA with children and youth with behavioural and emotional challenges and using knowledge gained from this experience Kerry introduced these ideas into sessions at RDA. 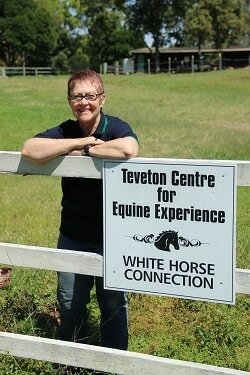 Kerry then created her own private program White Horse Connection at the Teveton Centre for Equine Experience at North Teven. This is an equine learning program. Kerry also works with Mental Health Professionals in an equine therapy program for youth at risk and children with behavioural and emotional challenges arsing from trauma. The Teveton Centre for Equine Experience is a centre for the well being of horses and humans. Kerry believes that the horse, a sentient, intuitive creature can be powerful in its interactions with humans and provides a rich learning experience about self and emotional awareness With their patience, unconditional acceptance and trust horses often seem to know just what is needed by a participant. Kerry believes it is an exciting and positive experience to partner with horses in this work.